We are the first filing and storage specialist focused on the needs of schools’ music departments. Whether you’re a high school in need of sheet music storage overhaul, or a university updating your music library we have the solutions you need. We specialize in sheet music storage systems that maximize space and preserve your sheet music library in a clean, tidy appearance. Our music filing systems will save you time hunting for the piece of music you’re looking for, and making re-shelving a breeze. Take back valuable space! 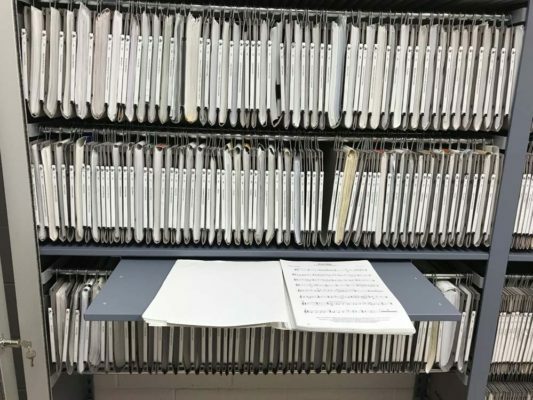 Put it to better use with our space-saving sheet music filing systems. Streamlined sheet music storage that will not only save space, but make retrieval and refiling a breeze. Instrument storage that can include secure tambour doors for shared spaces, and wide span shelving for large instruments. 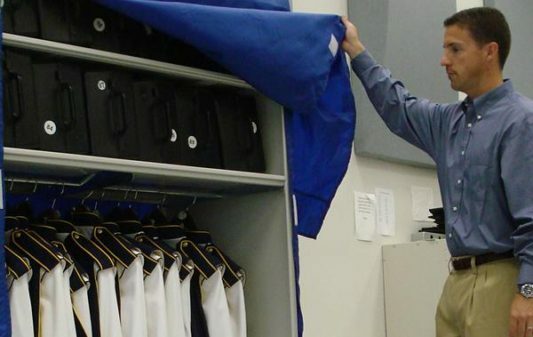 Marching band uniform storage and lockers for your students. We finished converting over to the new music filing system at the end of last school year and it is really every bit as amazing as everyone said it would be. I am VERY pleased. Locating and replacing music is quick and effortless, the way it should be for all music teachers. Fitting a tuba on a shelf isn’t easy, but we can help! 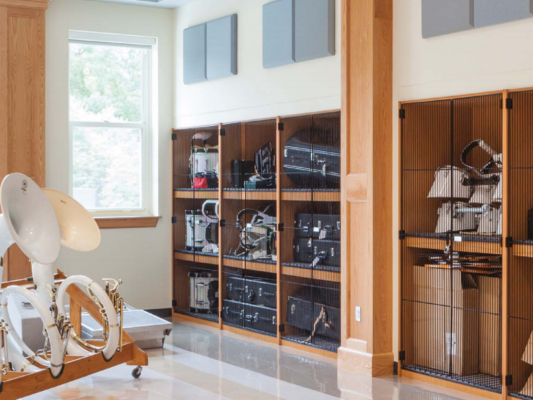 We can install wide-span shelving that be the perfect storage for your instruments—string, wind, and even your percussion pieces. Need secure storage? We can do that too by using custom lockers with locks, or pull-down tambour doors for secure music storage. Similar to how we design athletic storage for sports teams, we can create a sleek, functional storage solution to house your band uniforms. Keep your band’s jackets, shakos, pants, and sashes neat and tidy. Or you’re running low on space, we can use high-density shelving to create more storage in the same amount of space. 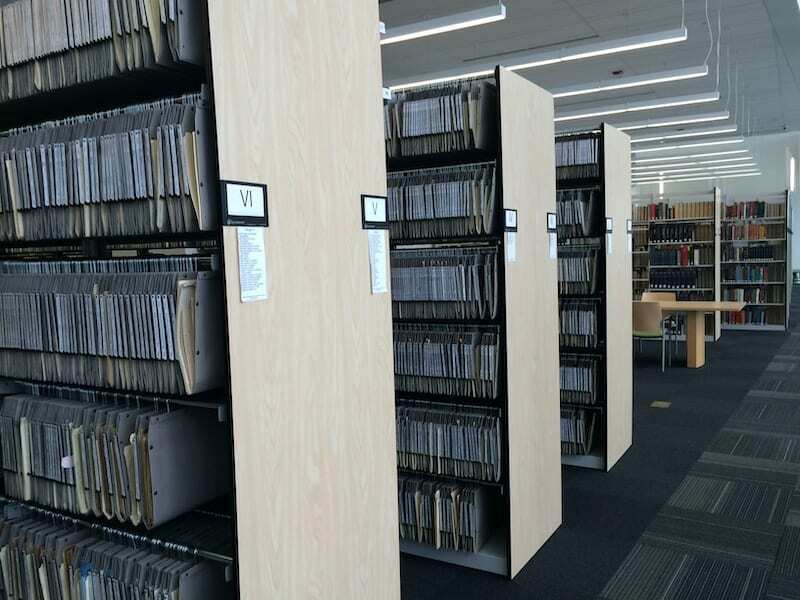 In addition to typical stacks, collaboration areas, and study rooms, the building also houses the Benjamin F. Ward Music Library, a highly specialized “library within a library” that contains 50,000 sound recordings, 55,000 musical scores, and thousands of pages of sheet music. Sheet music libraries require unique storage in order to provide accessibility for patrons and staff, protect the materials, and make smart use of available space. of your space, we can improve your music room so you spend less time finding music, and more time working with your students.